A friend recently gave me a Kobalt corded electric mower that he rescued from the curb. It would not start. I searched the internet and found very little info on this mower. The simplistic spec sheet I found suggested a failed starter switch as the likely problem. I have no need or desire for a corded mower as they are cumbersome and obsolete so I decided to spend no money or time troubleshooting and fixing the starter switch. The options remaining for me were cannibalizing for parts, conversion to battery power or giving it to someone. I decided to pursue the battery power option. First I needed to know what kind of motor it had. I opened the top, examined the motor and find a small label which stated 120V DC. 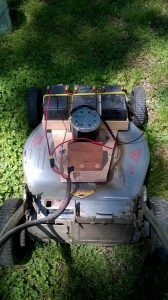 You may be asking why a corded A/C powered mower has a 120V DC motor. There are multiple reasons. The DC motors are simple and affordable and the trend is battery powered mowers and thus the economy of scale is kicking in. A look inside reveals simplicity. All that was needed was a rectifier to convert from 120V A/C to 120V DC. Aside from the motor and the switch component, that is all you see. A rectifier is one or more diodes allowing the flow of electricity in one direction, producing Direct Current. 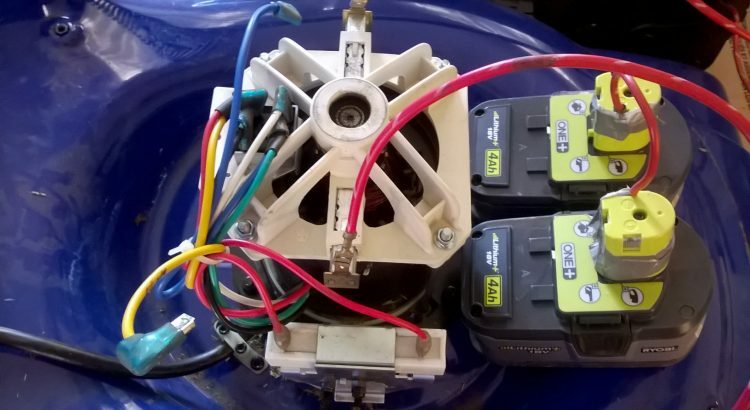 I refreshed my memory on powering a DC motor with less volts and tried test one using 2 Ryobi 18 volt batteries connected in series to produce 36 volts, approx, 1/3 of the 120 volts. Next I tried the mower cutting grass. It was apparent that was not enough power (volts and amps). So, my next test will be with a 80 volt battery. That may work. If not, I will replace the motor with a 36-48 volt model. That will be sufficient. My 36 volt mower that I have used for over a year works like a champ. And the 120V motor if I remove it? It will be used to generate electricity.